In October 2013, Texas Republican Sen. Ted Cruz took a lot of criticism for his doomed effort to defund Obamacare. It was an impossible goal; the GOP was in the minority in the Senate and a Democrat was in the White House. Under those circumstances, defunding President Obama's signature achievement simply wasn't going to happen. Establishment Republicans were angry at Cruz for raising the hopes of the party's base before certain disappointment. But there was one sense in which Cruz was right — and the words he spoke four years ago are resonating today in the GOP's struggle to repeal, or, more accurately, rewrite Obamacare. 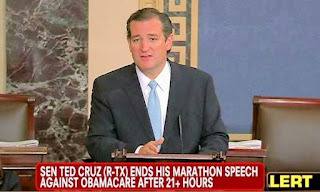 Cruz based the defund effort on his contention that once Obamacare was fully in place and subsidies began to flow — that was scheduled to begin on January 1, 2014 — there would be no stopping it. "The Obama strategy, I believe, is that on January 1, subsidies kick in," Cruz told a meeting of the Kingwood, Texas tea party in August, 2013. "And his strategy is very simple: He knows that in modern times no major entitlement has ever gone into effect and been unwound. Never been done. His strategy is to get as many Americans as possible hooked on the subsidies, addicted to the sugar." 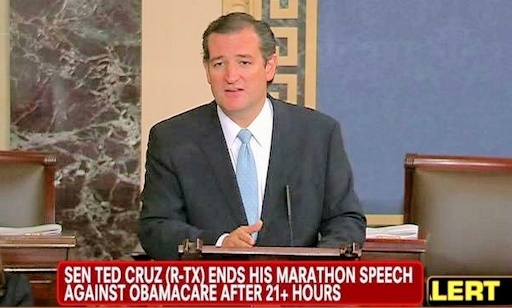 "I think if we're going to stop Obamacare, we have to do it now," Cruz continued. "If we get to January 1, this thing is here forever." Read the rest from Byron York HERE.